Sage…oh sage! I’ve wanted to try it since it opened, but there was always something to deter me from going. I finally tried it last week with a group of friends. The decor was posh and classy without being intimidating. However, looking at the rich tai tais and datos, I could not help but feel a little out of place. I must admit…my dining etiquette is slightly “rough on the edges”. Where do I start? Do I use the silverware furthest from my plate, or the furthest in? And I was dining with beauty queens…all of them poised and remarkably graceful. I tried to eat tiny bites (a great feat for someone like myself) and slowly. 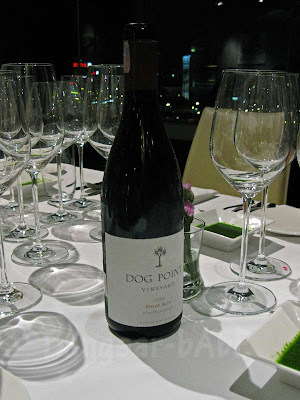 We started with a Pinot Noir 2006 from NZ’s Dog Point Vineyard. 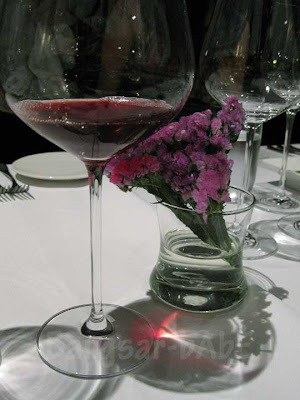 The wine was a deep ruby red colour. To the nose, it was earthy, full of ripe fruit and subtle oak. I enjoyed the fruitiness of the wine and it’s lovely, light aftertaste. The bread was really good. 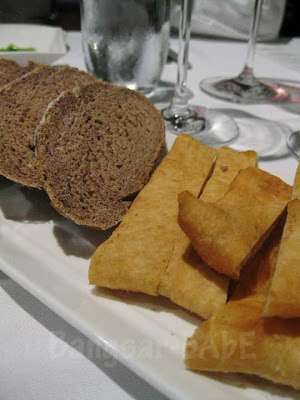 Crusty, soft and warm, my favourite was the one that resembled a breadstick. 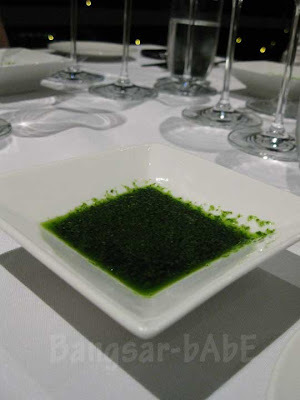 A fragrant pesto blended olive oil dip was served with the bread. 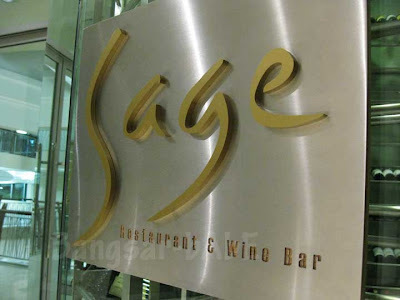 Sage serves French cuisine, with a subtle Japanese influence. 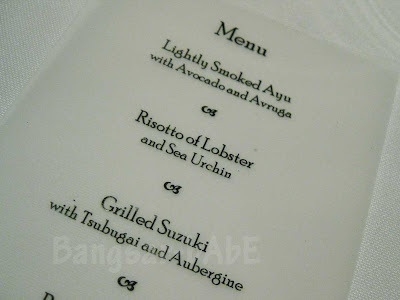 Our menu that night was specially created by Chef Takashi. Apparently, the people at my table dine here quite regularly. 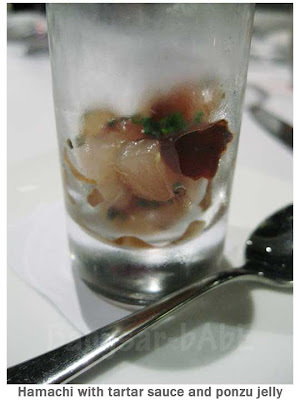 Our amuse bouche was hamachi (yellowtail) with tartar sauce and ponzu jelly. 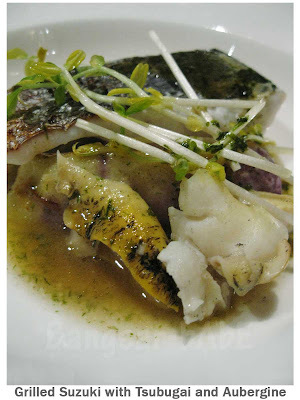 The fish was buttery rich and was perfectly complemented by the tart, citrus taste of the ponzu jelly. The smoked ayu (sweetfish) was well prepared. 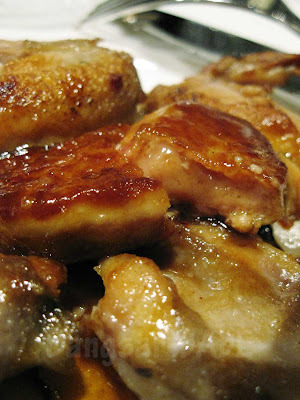 Crispy on the outside, the flesh was sweet with a distinctive smoky flavour. 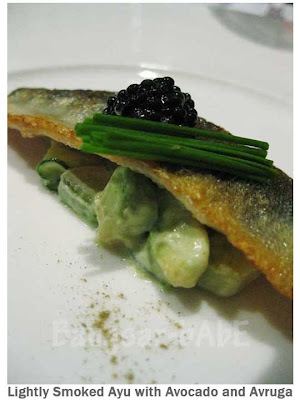 I loved its pairing with the creamy avocado and the glorious black caviar had a delicate, nutty flavour. I expected the caviar to taste fishy, but the fishiness was surprisingly subtle. I wasn’t particularly impressed with the Risotto of Lobster. 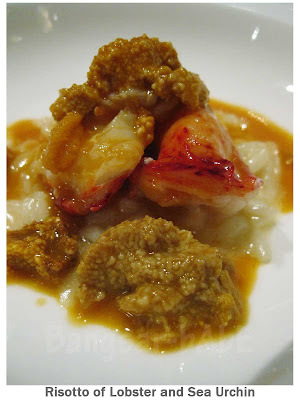 While the lobster itself was sweet and succulent, the risotto was undercooked, resulting in its hard and grainy texture. The sea urchin tasted of the sea, and had a soft, melt in the mouth texture. Too bad about the risotto. The grilled Suzuki (Japanese seabass) fared better. The fish was smooth and tender, with a delicate flavour. Served with tsubugai (Japanese shellfish with a slightly chewy texture) and firm yet tender aubergine, I found this combination a tad too mild for my liking. 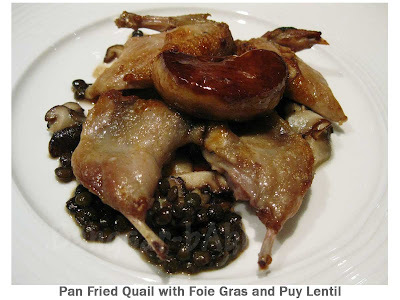 I’ve been wanting to try the quail with foie gras, as a friend mentioned he had the most divine foie gras here. The goose liver was deliciously creamy and fatty. This was the highlight of the whole dish. I didn’t think too highly of the quail, as some parts were slightly dry. But the melt in the mouth foie gras… was remarkably good! The wagyu a la Plancha was absolutely divine. “A la Plancha” means grilled on a metal plate. 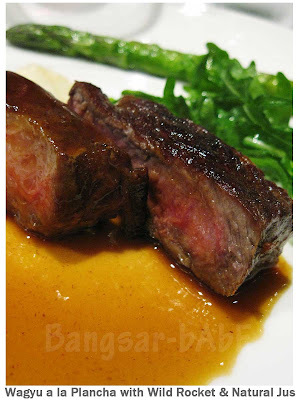 The beef had a uniquely buttery taste and texture, and rich marbling that infused every bite with supreme flavour. I savoured this as slowly as I could, hoping to prolong the experience. 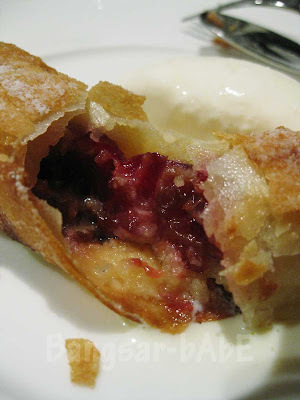 We ended the meal with Peach & Raspberry Sorbet and Crispy Roll of Dark Cherries. When I saw the menu, I had an inkling of how the roll would turn out. Like Joe said, “Essentially it was fried spring roll filled with gorgeous coarsely chopped cherries that was hard to eat”. And I was right. I got the same thing…except mine was filled with dark cherries instead of Tasmanian cherries. Not to say this wasn’t good; it was actually decent. 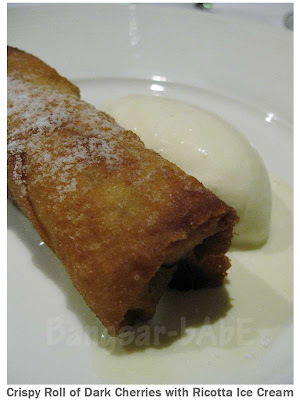 But I didn’t fancy the idea of having popiah as dessert. The ice cream tasted like vanilla ice cream with a tiny hint of ricotta. I expected it to be cheesy, but this was subtle and very nice. 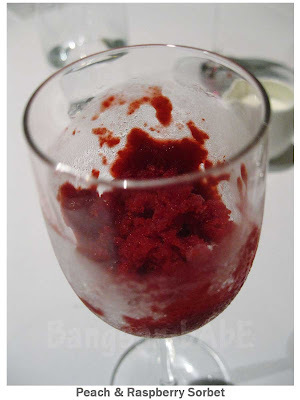 I liked the sorbet. It was sour and very refreshing after all the rich food we had. Dinner was lovely, and the company was great. While the portions were fine-dining size, they were mostly rich in flavour and texture. Not sure how much the bill came up to, but I’m guessing if I saw it, my jaw would drop. Thanks for dinner Daniel! Verdict: While there were a few misses, I really enjoyed the experience. Heard so much about this place and most of them were raving about it. Hmmm… so there are misses there, eh! The food looks wonderful… I think I've seen this place on a cable TV channel. 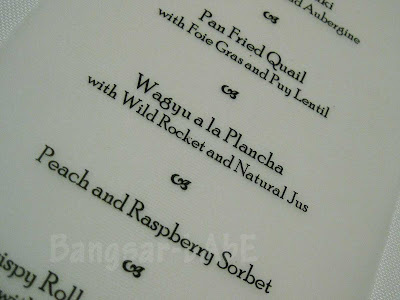 Seems to be a common dessert for dinner parties at Sage – that popiah with cherries! I also want the free meal, Daniel!! haha..maybe i'll try the lunch set tht Boo recommended! Unka – =D Yup…fit for a queen indeed! nomad – I guess for RM100 nett, it's more affordable. So you won't have to live on roti canai for the whole week! muku – Waaaa…How did you know this? Indeed a nice place to pamper oneself…indulging in such fine food. PureGlutton – Got a bit of misses la…I guess it can't all be perfect. But the food overall was good. ck lam – It was truly an indulgence! by the looks of that extensive menu and also use of caviar..the bill would have seriously been the highlight of the meal! So did you manage to jaga your manner that particular night?? hahaha… it's hard to change our eating style huh??? Table etiquette is that you always use the silverware nearest to your plate 🙂 but you probably know that already by now! oh my word.. did you NOT EAT again?! Errr…I thought it's the silverware furthest from the plate? Cos everyone in the restaurant was doing it that way. Nic – Yup…the food was artfully and skillfully prepared. Hahaha…they should skip the popiah!